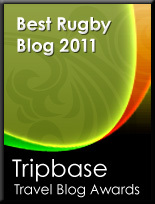 TOTAL FLANKER...a rugby blog: Who'd be a referee #2 ? Fairly shocking news from South Africa where apparently a spectator ran onto the field at the weekend and tackled one of South Africa's top referees from behind in a match between Grey High of Port Elizabeth and Daniël Pienaar of Uitenhage. The incident occurred with about 8 minutes to go in the match and with Grey leading 20-9. The idiot in question is believed to have been an old boy of Daniël Pienaar and rumour has it that his tackle on referee Phillip Bosch was the result of a drunken dare. Bosch, who cut the game short after the attack, was said to be suffering from back pain afterwards. 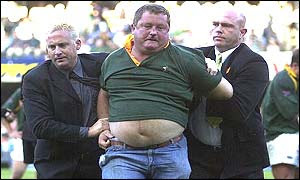 The assailant is reported to have yelled "Piet van Zyl" when making the tackle - a reference to the infamous incident in Durban in 2002 when 43 year old Springbok fan Piet van Zyl did his bit for the image of the Afrikaner male when he assaulted ref Dave McHugh during a Tri-Nations match between South Africa and New Zealand, dislocating the referee's shoulder in the process. On that occasion Van Zyl, a fine figure of a man as the picture shows, was 'sorted out' by Richie McCaw and AJ Ventner and was subsequently charged with assault. Drunken prank or not, I trust that the South African authorities will show the same lack of leniency to this moron. And they wonder why there is an accute shortage of referees in South Africa. Is there ANY country where there is not a shortage of ref's? In a word no, however, SA is increasingly struggling to supply top level ref, never mind the jobbers like me on the dirty track. To Anonymous - whoever you are - you are of course entitled to your opinion but you are obviously not a rugby player, coach, referee, volunteer or even, I suspect, a regular supporter. If you are any of these things then I fear that our game is in big trouble.